Improve alarm system performance and comply with new alarm management standards and regulations. It supports data exchange with new (greenfield) and existing (brownfield) control systems via import / export to MS Excel. Developed in accordance with the ISA- 18.2 standard and the EEMUA 191 guideline, it can be used by novices and experts alike to comply with alarm management good engineering practices. exida and Emerson Process Management have aligned to leverage exida’s alarm rationalization software SILAlarm™ and expert services to help customers improve the performance of their DeltaV alarm system. Looking for an Economic and Effective Alarm Management solution for your PlantPAx System? exida offers tools and training to create a more effective alarm management program. SILAlarm guides you step-by-step through the rationalization process. Each step prompts the user to document the necessary information and make the appropriate design decisions. This reduces the amount of training needed to use the tool and expands the number of personnel that can effectively use it. The user manual includes tips and techniques showing how to apply good engineering practices to rationalization taken from ISA-18.2 and EEMUA 191. Alarm priority helps the operator determine which alarm they should respond to first. Prioritizing alarms following a consistent methodology based on potential consequences and/ or time to respond helps build operator confidence and trust in the alarm system. It also helps optimize their response during upset conditions so that they are always responding to the situation which is most business-critical. To improve the operator’s response it is important to make sure they do not receive an excessive number of high priority alarms. SILAlarm calculates the configured alarm priority distribution and provides a comparison to the benchmarks of ISA-18.2, IEC 62682, and EEMUA 191. It allows non-alarm notifications to be categorized (e.g., alerts, prompts, messages) if they don’t meet the criteria for being an alarm. Rationalization involves reviewing and justifying potential alarms to ensure that they are truly necessary and that they meet the criteria for being an alarm as defined in the philosophy. Each alarm is examined to ensure it indicates an abnormal condition requiring a response (corrective action) from the operator. If an alarm has minimal consequences, or there is no defined operator response, then it can be disabled or designated for decommissioning. SILAlarm makes it easy to document the design intent (purpose of the alarm), potential consequences, cause of the alarm, methods for confirming that the alarm is legitimate, and the recommended operator corrective action. This information can be output in a report format from the master alarm database as an alarm response manual or individual alarm response procedures for each tag. These documents allow the results of rationalization to be used for operator training or integrated into the Human Machine Interface (HMI) to aid the operator’s response. Classification allows groups of alarms with similar characteristics and requirements for training, testing, documentation, data retention, reporting, or management of change to be lumped together for easier management. Alarms can be assigned to more than one classification. The origin of the alarm (P&ID, HAZOP, environmental permit, cGMP, etc.) can be documented along with any specific testing requirements which might be required to comply with pertinent regulations. The rationale used for alarm setpoint determination can also be documented. the user to define the trigger conditions for suppression, designate a common alarm, specify a maximum suppression time and indicate which alarms are to be suppressed. It also helps you to verify that the alarm can safely be suppressed by displaying the classification, priority, and whether the alarm is used as a safeguard or an independent protection layer. State-based alarming scenarios can also be defined by specifying alarm limit, priority, cause, consequence, and operator response as a function of operating state / mode, product type, or the phase of a batch. Safety related alarms are critical for maintaining the safety of the process, plant, and personnel. Alarms can serve as a safe- guard in a HAZOP, as an independent protection layer in a LOPA, or they can be identified in a Safety Requirements Specification. SILAlarm integrates the functional safety design requirements into the master alarm database and makes them available during rationalization. This provides traceability, creates a means for feeding alarm design details to the appropriate safety personnel, and ensures that safety-critical alarms are treated appropriately during the rationalization process. To help document relevant information about the alarm design, user-defined fields can be setup in SILAlarm to tailor the master alarm database to your requirements. For example these fields can be used to record safe operating limits, operating boundaries, equipment constraints (e.g. design, safety, corrosion, process, reliability, environmental), relevant interlocks, or whatever process safety information is required for compliance with OSHA 1910.119. This helps to create a consistent reference point for alarm system design and how it relates to operations. User Defined fields can be displayed in context during the rationalization process. Alarm rationalization is an ongoing process that is o en implemented in stages. SILAlarm helps manage and track the rationalization status of each alarm. Changes to alarm rationalization status (e.g. Under Review, On Hold, Open Action Item, Pending Approval, Approved, etc.) are recorded in a change log, along with relevant comments and the names of the participating rationalization team members. Once approved, alarms become “read only” and cannot be modified without first changing their status. To maintain the integrity of the alarm system it is recommended to periodically compare the settings in the master alarm database vs. those in the control system. SILAlarm can create a report on demand that identifies any all alarm parameters that are different based on evaluating a snapshot of the engineering configuration. Since it does not interface to the runtime database, no OPC interface is required and there is no need to identify which parameters should be included in the comparison. Each change can be reviewed to identify whether it should be accepted, rejected or set for enforcement. The differences report can be distributed to plant personnel for o line review and disposition. 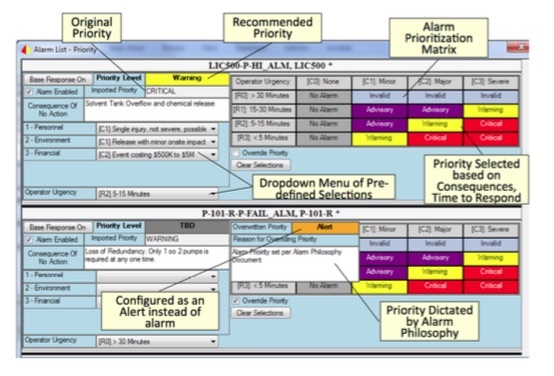 SILAlarm’s Alarm List View is the cockpit for managing the master alarm database and the status of the rationalization process. This spreadsheet-style viewer can be sorted and filtered to make it easy to segment a large database into small manageable pieces. It allows you to view key attributes of each alarm including alarm type, function block type, process area / unit / equipment, enable / disable status, priority and the rationalization status. The tool also allows you to categorize the source of each alarm for segmentation and tracking purposes. For example the source attribute could be used to differentiate the alarm’s origin by control system type (SIS, BPCS, PLC , SCADA), by system (Utilities, Packaging, Production areas, OEM Skid), by S88 Batch construct (Control Module, Phase, Equipment Module) or by type of alarm (Process, Fieldbus, Instrument Diagnostic, System Diagnostic). SILAlarm makes it easy to get data in and out for exchange with design tools, the control system configuration, or existing alarm database. Alarm information can be imported to SILAlarm in .csv or .xls file formats. Both generic and control-system specific import formats are available. Rationalized alarm information can be exported from SILAlarm enabling alarm configuration details to be propagated into the control system without requiring manual reentry of data. Alarm rationalization can be a resource intensive process. An effective tool streamlines the process by allowing you to apply the results from one alarm to other similar alarms. SILAlarm so ware is available in several different formats including single user licenses, site licenses, and so ware as a service. 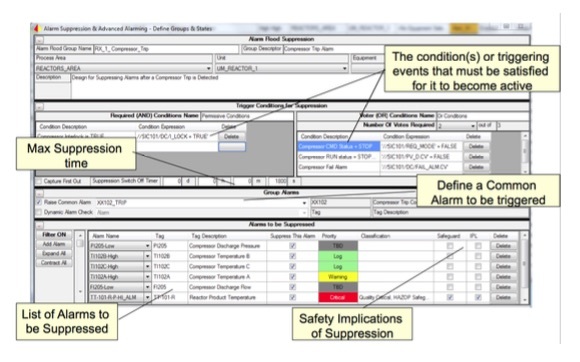 It is also available bundled with the exSILentia® safety lifecycle engineering tool suite. This provides flexibility in how you deploy it and allows you to coordinate / standardize its use between sites. Multiuser license for 5 or 10 concurrent users. Users must be connected to the same network (subnet) as the license server for the application to run. Application and database(s) are hosted remotely on an exida server. To access the application, users must have a web browser, an internet connection, and the Citrix® interface client installed. Projects can be stored on the exida servers as well as locally. Application and database(s) are hosted on the customer’s Citrix® Presentation Server. Users must have a web browser on their local machines and the Citrix® interface client installed to be able to access the application. exida has developed courses that will familiarize users with all facets of the exSILentia tool to ensure efficient implementation of the Safety Lifecycle tasks. This course will show how to implement alarm management best practices in your DeltaV system through the use of tools such as Alarm Help, DeltaV Analyze, DeltaV Mosaic, Alarm Shelving, Conditional alarming, System Alarm Management, XL Reporter, and SILAlarm. It will also discuss how to make your DeltaV system comply with the ISA-18.2-2016 standard “Management of Alarm Systems for the Process Industries” by following the alarm management lifecycle. Attendees will gain an appreciation for the alarm management capabilities available in DeltaV so that they can determine how to best apply them to their operations. The course prepares participants to support an alarm management program for a DeltaV system including tasks such as creating an alarm philosophy document, performing alarm rationalization, analyzing alarm system performance, alarm system maintenance, and resolution of alarm management issues. This course will show how to implement alarm management best practices in your Rockwell control system through the use of tools such as Factory Talk Vantage Point, Alarms Builder, Alarm Shelving, conditional alarming, XL Reporter, and SILAlarm. It will also discuss how to make your PlantPAx system comply with the ISA-18.2-2016 standard “Management of Alarm Systems for the Process Industries” by following the alarm management lifecycle. Attendees will gain an appreciation for the alarm management capabilities available in their control system so that they can determine how to best apply to their operations. The course prepares participants to support an alarm management program including tasks such as creating an alarm philosophy document, performing alarm rationalization, analyzing alarm system performance, alarm system maintenance, and resolution of alarm management issues. Attendees will learn how to conduct alarm rationalization of greenfield (new) or brownfield (existing) applications in order to optimize performance of their alarm systems. The class immerses participants in discussion and hands on exercises which have been designed to demonstrate the best practices and requirements for rationalization as taken from the ISA-18.2 alarm management standard and EEMUA 191 guideline. The class focuses on how rationalization can lead to improved operator performance by eliminating / preventing common alarm problems such as nuisance / chattering / stale alarms, incorrect priority, alarm overload, and alarm floods. It also includes a discussion on tips and tricks for creating an alarm philosophy document, such as how to effectively define the “rules” for rationalization. Exercises will use exida’s SILAlarm rationalization tool.